CP-690550 reduced the severity of ischemic damage. (A) CP-690550 (10 μM) suppressed IL-17 production by cdT cells and activated memory T cells. cdT cells and CD4+ CD44+ memory T cells isolated from C5BL6J mice through flow cytometry were stimulated for 24 h with plate-bound monoclonal antibodies to CD3 (2 ng/ml) and CD28 (1 ng/ml) in the presence or absence of IL-23 (25 ng/ml). IL-17A production and IL-17A expression level were measured by quantitative RT-PCR (a) and ELISA (b). (B) CBF reduction after brain ischemia. (C) Time-dependent changes in neurological score. *p < 0.05. (D) Infarct volume as visualized through TTC staining on day 3 in CP-690550 (CP)- and vehicle-treated mice. Biochem Biophy Res Commun 2010 402, 500–506. Tofacitinib (CP-690550) Citrate purchased from Selleck. The STAT3 inhibitor CP690,550 inhibits arthritis in vivo and the expression of IL-6 cytokine family in vitro. (A) Whole-cell lysates from MC3T3-E1 cells stimulated with IL-1β (10 ng/ml) plus CP690,550 at the indicated concentrations were analyzed by immunoblotting to detect pSTAT3 and STAT3. Actin served as an internal control. (B) 6-week-old DBA/1 male mice were given an initial injection of type 2 collagen on day -21, and arthritis was induced with a second injection on day 0. Vehicle or CP690,550 (15 mg/kg/day) was administered intraperitoneally once daily for 2 weeks from day 0 (n = 4 per group). Arthritis scores were measured three times a week. (C and D) Total RNA was prepared from primary osteoblasts treated with IL-1β (10ng/ml), TNFα (10 ng/ml) or OSM (50 ng/ml) with (+) or without (-) CP690,550 (100nM) for 24 hours, and IL-6 expression relative to β-actin was analyzed by quantitative real-time PCR. Data are means ±SD of IL-6/β-actin. (*P < 0.001; n = 3). (E) IL-6 protein levels in the supernatant of osteoblasts treated with IL-1β (left panel) or TNF (right panel) plus indicated concentrations of CP690,550 for 24 hours were assessed by ELISA. Data are means ±SD of IL-6 (pg/ml). Dr. Akihiko Yoshimura of Akihiko Yoshimura. Tofacitinib (CP-690550) Citrate purchased from Selleck. STAT3-inhibition antagonizes arthritis effects in vivo. (A) 6-week-old DBA/J1 male mice were given initial injection of type 2 collagen on day -21, and arthritis was induced with a second injection on day 0. Vehicle or CP690,550 (15mg/kg/day) was administered intraperitoneally once daily for 2 weeks from day 7 (n = 4per group). Arthritis scores were measured three times a week. (B) Total RNA was prepared from the tissue of hind paws of CIA induced mice after 2 weeks of treatment by vehicle or CP690,550, and expression of IL-6 cytokine families (IL-6, OSM, IL-11 and LIF) relative to β-actin was analyzed by a quantitative real-time PCR. (C) IL 6 serum levels in sera of CIA induced mice after 2 weeks of treatment by vehicle or CP690,550 were assessed by ELISA. (D) Specimens of ankle joints from CIA mice treated with vehicle or CP690,550 for 2 weeks were subjected to immunofluorescence staining for pSTAT3. Nuclei were visualized by TOTO3. Bar, 100 μm. (E) Whole cell lysates were made from ankle joint tissues of CIA mice treated with or without CP690,550 for 2 weeks. Phosphorylated-STAT3 was then analyzed by western blot (upper panel) and ELISA (lower panel). Results are representative of at least three independent experiments. Saraswati Sukumar of Johns Hopkins University School of Medicine. Tofacitinib (CP-690550) Citrate purchased from Selleck. CP690,550 is effective in treating collagen-induced arthritis in vivo. 6-week-old DBA/J1 male mice were given an initial injection of type 2 collagen on day 21 and arthritis was induced with a second injection on day 0. Vehicle or CP690,550 (15mg/kg/day) was administered interperitoneally once daily for 2 weeks from day 0 (n = 4 per group). Tissue specimens from the ankle of CIA mice administered vehicle or CP690,550 were stained with safranin O and methyl green. Bar, 100 μM. Representatives of at least two independent experiments are shown. Tofacitinib citrate decrease a delayed-type hyper-sensitivity response and extended cardiac allograft survival in murine models. Furthermore, Tofacitinib citrate treatment of ex-vivo-expanded erythroid progenitors from JAK2V617F-positive PV patients results in specific, antiproliferative (IC50 = 0.2 μM) and pro-apoptotic activity. In contrast, expanded progenitors from healthy controls are less sensitive to Tofacitinib citrate in proliferation (IC50 > 1.0 μM), and apoptosis assays. During 2 weeks of Tofacitinib citrate dosing at 10 and 30 mg/kg/d, a significant, time-dependent decrease in NK cell numbers relative to vehicle treatment is observed. Effector memory CD8+ cell numbers in the Tofacitinib citrate-treated group are 55% less than those observed in animals treated with vehicle. The JAK1, JAK2, and JAK3 kinase assays utilize a protein expressed in baculovirus-infected SF9 cells (a fusion protein of GST and the catalytic domain of human JAK enzyme) purified by affinity chromatography on glutathione−Sepharose. The substrate for the reaction is polyglutamic acid-tyrosine [PGT (4:1)], coated onto Nunc Maxi Sorp plates at 100 μg/mL overnight at 37 °C. The plates are washed three times, and JAK enzyme is added to the wells, which contained 100 μL of kinase buffer (50 mM HEPES, pH 7.3, 125 mM NaCl, 24 mM MgCl2) + ATP + 1 mM sodium orthovanadate). For Tofacitinib citrate, it is also added for kinase assay at different doses. After incubation at room temperature for 30 min, the plates are washed three times. The level of phosphorylated tyrosine in a given well is determined by standard ELISA assay utilizing an anti-phosphotyrosine antibody. Determination of growth inhibition by Tofacitinib citrate is performed using identical culture conditions for both FDCP-EpoR JAK2WT and JAK2V617F cell lines. Briefly, 1 × 105 cells/mL are cultured in 96-well flat-bottom plates at 37 °C in a humidified 5% CO2 atmosphere using RPMI 1640 supplemented with 1.25% FCS, and 5% WEHI supernatant. Decreased FCS concentration is necessary to prevent binding between Tofacitinib citrate and serum proteins. Growth inhibition assays are terminated by addition of 20 μL CellTiter96 One Solution Reagent. Flat-bottom plates are incubated for an additional 3 hours for MTT assay. Absorbance is determined at 595 nm on a BioTek Synergy-HT microplate reader. Results are the average standard deviation of three independent determinations. Flanagan ME, et al. J Med Chem, 2010, 53(24), 8468-8484. Manshouri T, et al. Cancer Sci, 2008, 99(6), 1265-1273. Conklyn M, et al. J Leukoc Biol, 2004, 76(6), 1248-1255. Changelian PS, et al. Science. 2003, 302(5646), 875-878. What is the difference between the two products (S5001, S2789)? Tofacitinib (S2789) is the base form of Tofacitinib citrate (S5001). The biological activity of these two compound are same. S5001 is better than S2789 for Oral gavage. 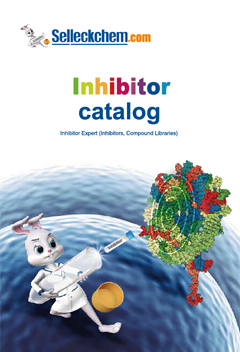 Ruxolitinib (INCB018424) : Pan JAK1/2 inhibitor, IC50=3.3 nM/2.8 nM. AZD1480 : JAK2, IC50=0.26 nM. Tofacitinib (CP-690550,Tasocitinib) : Approved by FDA for rheumatoid arthritis (RA). XL019 New : Potent and selective JAK2 inhibitor with IC50 of 2.2 nM, exhibiting >50-fold selectivity over JAK1, JAK3 and TYK2. 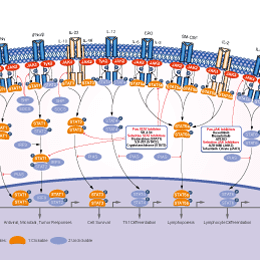 Baricitinib (LY3009104, INCB028050) is a selective JAK1 and JAK2 inhibitor with IC50 of 5.9 nM and 5.7 nM in cell-free assays, ~70 and ~10-fold selective versus JAK3 and Tyk2, no inhibition to c-Met and Chk2. Phase 3.